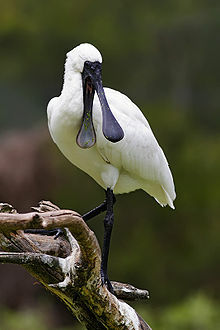 For other uses, see Spoonbill (disambiguation). Spoonbills are a genus, Platalea, of large, long-legged wading birds. The spoonbills have a global distribution, being found on every continent except Antarctica. The genus name Platalea derives from Latin and means "broad", referring to the distinctive shape of the bill. Six species are recognised, which although usually placed in a single genus have sometimes been split into three genera. All spoonbills have large, flat, spatulate bills and feed by wading through shallow water, sweeping the partly opened bill from side to side. The moment any small aquatic creature touches the inside of the bill—an insect, crustacean, or tiny fish—it is snapped shut. Spoonbills generally prefer fresh water to salt but are found in both environments. They need to feed many hours each day. They have traditionally been thought to form one of two subfamilies, Plataleinae, in the family Threskiornithidae, which also includes the ibises (Threskiornithinae). Molecular studies, including a 2013 study, have suggested instead that they form a clade within the family with several cosmopolitan ibis genera, separate from another clade of New World ibis. A 2010 study of mitochondrial DNA of the spoonbills by Chesser and colleagues found that the roseate and yellow-billed spoonbills were each other's closest relative, and the two were descended from an early offshoot from the ancestors of the other four spoonbill species. They felt the genetic evidence meant it was equally valid to consider all six to be classified within the genus Platalea or alternatively the two placed in the monotypic genera Platibis and Ajaja respectively. However, as the six species were so similar morphologically, keeping them within the one genus made more sense. The spoonbills are most distinct from the ibises in the shape of their bill, which is long and flat and wider at the end. The nostrils are located near the base of the bill so that the bird can breathe while the bill is submerged in water. The eyes are positioned to provide spoonbills with binocular vision, although when foraging tactile senses are important too. Like the ibises the spoonbills have bare patches of skin around the bills and eyes. Spoonbills are monogamous, but, so far as is known, only for one season at a time. Most species nest in trees or reed beds, often with ibises or herons. The male gathers nesting material—mostly sticks and reeds, sometimes taken from an old nest—the female weaves it into a large, shallow bowl or platform which varies in its shape and structural integrity according to species. The female lays a clutch of about three smooth, oval, white eggs and both parents incubate; chicks hatch one at a time rather than all together. The newly hatched young are blind and cannot care for themselves immediately; both parents feed them by partial regurgitation. Chicks' bills are short and straight, and only gain the characteristic spoonbill shape as they mature. Their feeding continues for a few weeks longer after the family leaves the nest. The primary cause of brood failure appears not to be predation but starvation. The six species of spoonbill are distributed over much of the world. (Platalea leucorodia) Adults and juveniles are largely white with black outer wing-tips and dark bills and legs. Breeds in reed beds, usually without other species. This is the most widespread species, which occurs in the northeast of Africa and much of Europe and Asia across to Japan. (Platalea minor) Found in Taiwan, China, Korea and Japan. (Platalea regia) Most common in south-east Australia, but regularly found in smaller numbers on other parts of the continent when temporary wetlands form; in New Zealand, particularly the South Island, and sometimes as stragglers in New Guinea, Indonesia, and the Pacific Islands. ^ Jobling, James A (2010). The Helm Dictionary of Scientific Bird Names. London: Christopher Helm. p. 309. ISBN 978-1-4081-2501-4. ^ Ramirez, J.L. ; Miyaki, C.Y. ; Del Lama, S.N. (2013). "Molecular phylogeny of Threskiornithidae (Aves: Pelecaniformes) based on nuclear and mitochondrial DNA" (PDF). Genetics and Molecular Research. 12 (3): 2740–2750. doi:10.4238/2013.July.30.11. ^ Chesser, R.Terry; Yeung, Carol K.L. ; Yao, Cheng-Te; Tians, Xiu-Hua; Li Shou-Hsien (2010). "Molecular phylogeny of the spoonbills (Aves: Threskiornithidae) based on mitochondrial DNA". Zootaxa (2603): 53–60. ISSN 1175-5326. ^ Matheu, E.; del Hoyo, J. (2017). del Hoyo, Josep; Elliott, Andrew; Sargatal, Jordi; Christie, David A.; de Juana, Eduardo, eds. "Ibises, Spoonbills (Threskiornithidae)". Handbook of the Birds of the World Alive. Barcelona, Spain: Lynx Edicions. Retrieved 5 December 2017. (Subscription required (help)). Wikimedia Commons has media related to Platalea.